I was a bit uninterested to read this book just because of its name. As I thought it was a 'motivating' kinda stuff which I avoid. But after having read the plot summary - I got mighty curious to know how the writer-Ashwin Sanghi have shaped up such a tricky plot that involves mythology as well as a thriller, and that too - dealing with the 10th avatar of Lord Vishnu - Kalki Avatar !! And, also as it dealt with the lost civilizations - this was something I would never miss (as I am always keen to visit such places, and have visited a few). So there, I jumped in to read 'The Krishna Key'. And from the first chapter itself, it got me hooked. (Man, this review is really a tough one cause I have to be so limited what to write-given the book deals with mysteries, thriller and suspense). How minute details Ashwin has taken care of, is visible since then. And from the second chapter, you know how extensive the 'past tales' are going to get. Getting so deep into the myths, facts and legends, it left me 'jaw dropped' at many pages. How he seamlessly weaves legends with the 'possible facts' and the theories behind the present we see in daily routine are hard to not believe in. (sample - design of the Shiva Lingam) (It took four days for me to complete this book-and all those days I was sharing this things with colleagues just to see how shocked they were to know). Researched extensively with the help of tons of material - books, blogs, videos and so on, The Krishna Key never feels a superficial thriller. Though there are moments when very deep discussions between the characters (may) bore you, but as the story progresses, you tend to believe that as a necessary part. One interesting pattern AS has followed here to write a parallel story. The story of Lord Krishna himself. I suppose that was done so because not all of us know Mahabharata as deep as described here. Even me, I was surprised at some connections in the Mahabharata that are never told in the current versions. But for the reader who knows Mahabharata, the parallel Krishna story hinders the pace more when finale is nearing. But as everything is not perfect - there are glitches that hinders it from becoming a flawless one. Brand fascination of the writer is clearly visible from initial chapters, that is annoying. (Using brand names for phones and jeans - are too much). Living that (personal rant) apart, the flashbacks in concluding chapters - surprised me. How can you make the reader read it - who is on the edge to know the secret - and he get flashback of a lead character. I don't know if it can be avoided or placed somewhere else, but the flow is a bit slowed down because of that. Still, the edge-of-seat revelations, the mysteries unfolding one by one, absolutely brilliant amalgamation of the facts from the pages of History and the nail biting suspense. All of them makes The Krishna Key - unputdownable. A highly recommended for those who love Mythology, those who love thrillers, those who love History. Walking on many ropes at a time - Ashwin Sanghi balances the job in near perfect fashion. Go, read and reveal the mysteries of the History. I seriously wish someone please convert this into a film. Or a grand TV series. That would be a killer. A Film about Films : Some Favorites.. This post have emerged all of a sudden. After reading all the trashy reviews of 'Heroine' - a film about films, the idea came up. (and may be, mr Bhandarkar can get some hints here, how to make a film based on his own industry). Here, are some favorites of the genre. I have limited my list to only 'recent' releases and have not dared to touch classics like 'Kaagaz Ke Phool'. Please add your favorite - recent or classic 'film about films' in comments section. 4. Khoya Khoya Chand : Released around similar time as the previous one, this - by Sudhir Mishra was altogether a detailed one on the film industry, but the past era. An ode to Gurudutt saab's Kaagaz Ke Phool, KKC wonderfully recreated the golden days. Along with Shiney Ahuja (yes, here too) Soha Ali Khan got perhaps her most meaty role till date. The real treat in this one was fantastic score by Shantanu Moitra that still lingers. 3. Om Shanti Om : Really ! This one is listed here. For its 'loaded with masala' tribute to the industry of 70s and later. A wackiest award function, cameo filled song, outstandingly filmy climax and all the incarnations and re-incarnations. This Farah Khan directed 'SRK is superhero' flick has always been a favorite. 2. Luck By Chance : Loaded with references to all the people in the industry, in a good way ofcourse. Loaded with lots of heart warming cameos. Loaded with brilliants moments, dialogues and songs - this Zoya Akhtar directed movie was a wonderful insight in today's Bollywood. Depicting stragglers in industry - Farhan Akhtar and Konkona Sen were oh-so-perfect. And so perfect were the cameos - Aamir-SRK-Hrithik.. ahhh..... and not to forget - one of the Best opening credits. 1. Harishchandrachi Factory : A fantastic bio-pic in Marathi language, about Father of Indian cinema - Dadasaheb Phalke - is easily my first recco when someone asks for non-Hindi films. Paresh Mokashi flawlessly tells the story of a man who put everything that belonged to him, at stake, to make a motion picture - Raja Harishchandra. Title role played by Nandu Madhav - this one is 'Do Not Miss at any cost' film, about films. Its all about tonight - is that track where you don't pay attention to words - like the sound as long as its played and then - forget it. Saiyaan - (arghhhhhhh...) is another Rahat Fateh Ali Khan track (double arghhhhhhh...) that starts off as a slow one and graduates into a qawwali styled beats (triple arghhhhhhh..). You know what I mean there. Next Jaane Bhi De is a relief. This smooth duet sung by Sonu Nigam and Sunidhi is 'templatised', yet nice listen. Again, the cringe-fest continues. In Teri choodiyaan da crazy crazy sound - Wajid puts 'wannabe punjabi popstar' to shame. And Kudiye di kurti is sounds like picked up from 1994 stock. Highly avoidable soundtrack by Sajid-Wajid. Oh Dear Priety - what did you do? Tags :Ishkq in Paris music review, ishq in paris review, music review, songs review, sajid wajid, priety zinta, rehan malik, reihan malliek, prem raj, priety comeback movie. Ranbir. How can one 'not' love this guy? No resemblance to his (legendary) ancestors, he on himself has created his own charm, his own style of act that is inimitable. Oozing brilliance in each frame that proves that (stealing words of my fav critic) 'he himself is his own competition'. In the title role of Murphy, Ranbir Kapoor has lived the characters, so brilliantly, that perhaps even the creator of the character wouldn't have thought. Barfi! - is story of Murphy, a deaf mute guy and Jhilmil-an autistic girl. Oh, so now you will think of other movies that made you feel pity/ made fun of differently abled persons. Well, this one, is definitely not one of them. This, is simply, a fairy tale involving the two - and told by third protagonist. Shruti - who falls for Murphy (who wouldn't?). Murphy, despite of his disabilities, is specially abled. to make everyone happy, everything around him - go cuddly soft just because of him. His Charlie Chaplin inspired mannerisms are There isn't a single preachy / glycerin induced moment that makes the movie so original, far from typecast. And you know it from the very first - even before the first frame of the movie is shown. Highly innovative 'Picture shuru..' sung by Swanand Kirkire that is played during pre-title acknowledgements is the most innovative idea - giving hint of the originality of the movie. The storytelling makes you fall in love with everything going on the screen. Thank You Anurag Basu for bringing us back to childhood. Set in Darjeeling and partially in Kolkata, Ravi Verman's lens infuse instant love affair with the celluloid. There are times when there is hardly any 'talk' going on the screen. But the flawless camerawork speaks and moves you. 'The umbrella scene', is just an example of that brilliance when there is hardly any background score present. But Ranbir's act and the camera does make you cry. 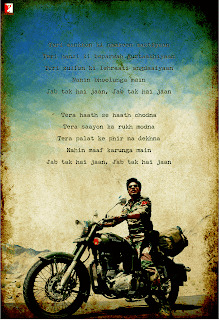 On the other hand, its Pritam's score that makes you drool over the ongoings. Its been ages since we heard something so cheerful and colorful as 'itti si hansi' and 'Kyon'. The movie wouldn't have been the same without the songs & the background score - fabulously done by Pritam. While Ranbir is - Love at first frame, Priyanka's Jhilmil - is someone that takes time to grow. But when she does, one would forget there is an actress on the screen. I had fear she might be like 'female SRK' in this one. Thankfully she's not. She's so perfect, its hard to imagine someone else on her place. Director's touch. And, another lady, oh my ! Ileana D'cruz is so ravishing and her act is equally, flawless. At each stage of her age, she portrayed perfect part. (Thank Lord, Katrina refused this role). Even, the supporting leads like - Akash Khurana as Murphy's dad, Roopa Ganguly as Shruti's mom, Barfi's partner in crime and Saurabh Shukla. Everyone has their own share to make Barfi - a heartfelt experience. Ofcourse, its not a perfect one. Nothing in the world is. Barfi has its flaws in second half, while the story unnecessarly gets itself into twists and turns and thriller like things. Even there is a lag in pace towards the climax. 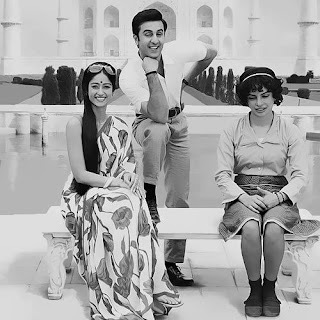 But handled by Basu and Kapoor - in the end forgive these glitches when you see Barfi and Jhilmil dancing to Chhau dance and later, Itti si hansi. You know its been a great experience when you leave the hall with broad smile and moist corners of your eyes. Barfi, a fairytale, a poetry, a delicious dish you would want to have again and again and that too, feeling free from guilt. Easily, the best of this year. Nothing is there 'to review'. Avoid..
As requested by a reader, in comments section of my previous post, here is the poetry - by Gulzar saab. And my attempt to translate it. A literal one, not a poetic translation this one is. I will never forget, Till I die, Till I die. jab tak hai jaan, jab tak hai jaan. I will never forgive, Till I die, Till I die. The much awaited announcement is finally done. 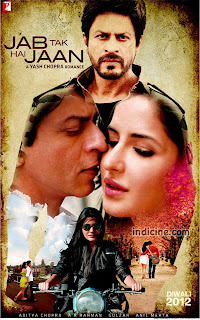 In a rather disappointing way - getting hint from Anand Bakshi's hit song from Sholay - the Yash Chopra Romance - starring Shahrukh Khan, Katrina Kaif and Anushka Sharma - is titled Jab Tak Hai Jaan ! Well, the poster seems a modified stuff of what the leaked photos were all about. But main star here, in the poster is Gulzar saab's words. Check out for yourself. Shilpa Rao and Amit Trivedi's combination hits the perfect chords in Badla Nazara (English Vinglish) instantly. Thankfully, the angrezi lyrics don't annoy here, it rather makes it a superb listen. 'Aflatoon, hai junoon' part is killer. The track repeats as AT as sole singer, works fine as always. Penned by Swanand Kirkire, Dhak Dhuk has wonderful lyrics which are brilliantly put into the tune by Amit, with Garba beats and flute - this one lingers in your mind for long. Manhattan - is clearly a situational one, yet works with the fast beats and the vocals of Clinton + Bianca Gomes. While Gustakh Dil is a standard, predictable 'pathos by AT' template, sung by Shilpa Rao. Lastly, taking cue from Marathi folk, Navrai Majhi - is a cheerful, foot tapping mix of sounds. Sung by Swanand, his mother Neelambari Kirkire and Sunidhi Chauhan - the track is addictive. A perfect - verfect soundtrack for the movie. Amit Trivedi continues spreading brilliance with his own - tried tested sounds. I don't understand the fascination with the English lyrics to make a song 'happening'. In most of the songs, it kills the mood in this rather mixed bag album of Student of The Year (SOTY). Radha is the perfect example for this. Starting with very interesting piece sung by Shreya, the song picks up with (lame) English lyrics, but its the Vishal's part, the looped 'radha teri chunri...' saves the track and making it an ear-worm. Shreya has done a perfect job here. Oh wait, there is a surprise - Udit Narayan, though as a cameo, he steals the show. Taking cue from prelude of 'Adha Ishq (BBB)', Salim, Shekhar & Sunidhi's Ishq Wala Love is flawless. Ratta Maar - with its 3Idiots inspired lyrics, has interesting tune and use of chorus, making a fine listen. Glitch comes in form of The Disco Song. Yes, the Disco Deewane. Some says its superb, some says its not. I am in the later category. The newly added 'pacey beats and other ingredients' work only when the original Nazia Hassan lines appear. While next two tracks Kukkad and Vele - both are just good to play loud in a car, in North India, specifically. Finally, the mashup - a fine mix that doesn't harm much as the last tracks do. Can't believe this is the soundtrack of a KJo film ! Vishal-Shekhar has given some great sounds through this year. Here, its opportunity wasted or performance (producer) pressure ? My picks : Radha, Ishq, Ratta.